Last Friday night, IHC Remix kicked off with Musicfest, a three-hour music extravaganza featuring various interpretations of pop, classical and rock pieces. Whether students were there to support their friends, their house, or even to relax after a long week, Musicfest proved to be enjoyable for all. Throwing together a performance in two weeks is no mean feat, and the criteria for this year’s competition, organised by Chamber Ensemble, did not make things any easier for participants. In 10 to 15 minutes, each house was to put up one classical re-arrangement of a pop song, and the reverse: one re-arrangement of a classical piece in any other form. Judging that night’s performances were Ms Michelle Kwok (our GP teacher), Mr Jarrod Lee (an ex-teacher with Broadway-style vocal experience) and Mr Hazli (our very own sound technician). What makes a good performance? Houses were rewarded for audience engagement, technical proficiency and diversity of instruments onstage. An additional, unspoken criteria which affected audience engagement was song choice. Although many Rafflesians have some form of musical background, those who don’t tend to be able to identify with and appreciate more mainstream pop/rock tunes, while obscure songs let the audience’s minds wander. 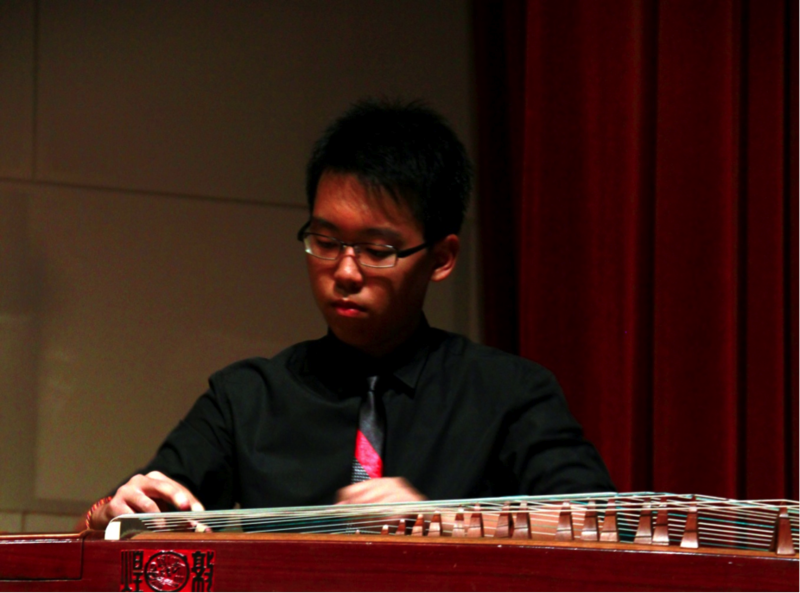 BB’s Nicholas Quek’s guzheng rendition of a pop song entertained and enthralled the audience. As a whole, houses fared well in terms of technical proficiency. 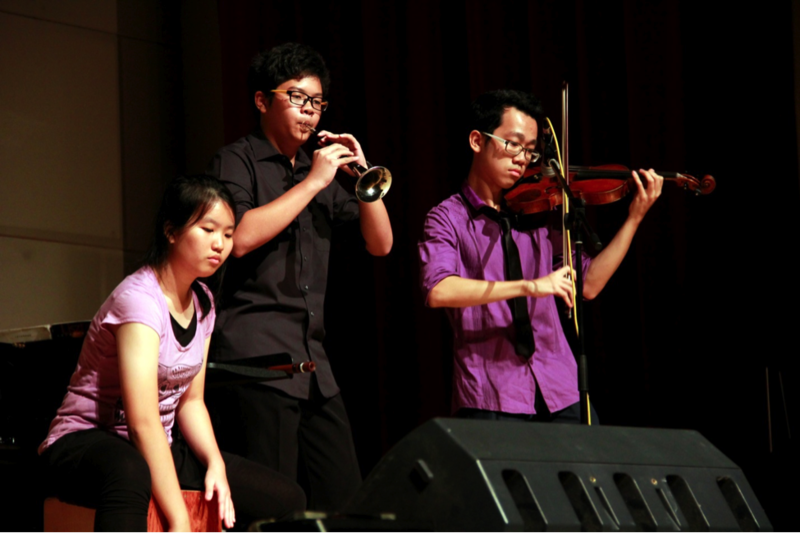 Many of the Musicfest participants are H2 Music students or members of various performing arts CCAs, which heightened the baseline standard. The performers taking the stage were individually capable and many were well rehearsed, which showed in their confident performances and the fact that few needed to refer to their score sheets. Individual highlights included Nicholas Quek of BB with his invigorating guzheng take on If I Lose Myself, and MR’s drummer, Shaun Mak, who provided the perfect rhythm for MR’s power vocalists Jonathan Boey and Esther Chan’s with their rendition of Where Have You Been. HH vocalist Melissa Tang’s sultry vocals shone during her jazzy performance of her house cheer in song form, drawing audible gasps from the audience, while HH’s piano rendition of Erlkonig, especially the sustained ostinato in the bass, was technically stunning. Of course, the performances were not judged on the basis of individual competency – Mavis Tan, who helped with arranging MT’s set list, said, “The important thing about a performance is that it must be put together, on time, and in tune.” The challenge of including a diversity of instruments and unifying each instrument’s distinctive sound added a new dimension of complexity to the competition. Over the course of the night’s performance, an eclectic mix of instruments from the suona to the egg shaker made their appearance onstage. As Mr Lee said, while all performers were individually proficient, it was working together to produce a cohesive set piece that truly tested each house’s abilities. BB took the stage as one team and impressed the audience with their fluid arrangement which also left room for showcasing individual talent. 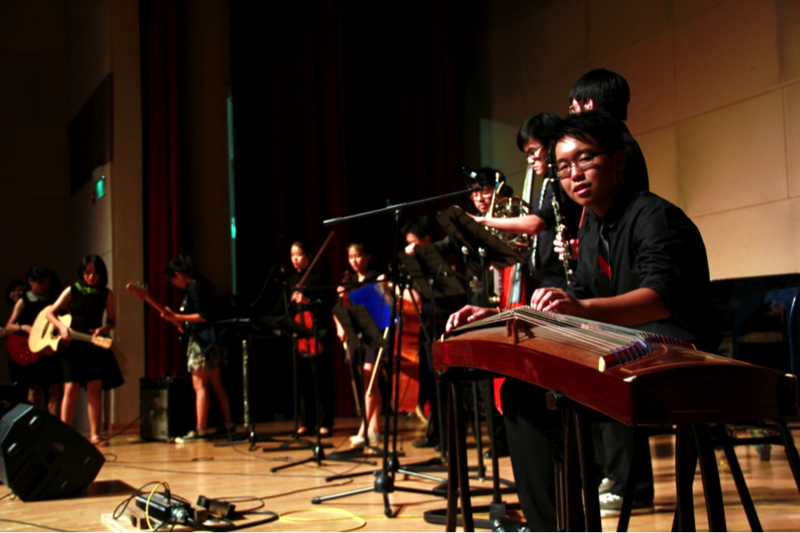 Ultimately, Musicfest had as much to do with good arrangements and capable performers as it did with good teamwork. BB’s strategy in the competition was inclusive and got everyone on board while letting each individual shine. As Daniel Ang, BB’s double bassist and co-composer puts it, they were able to come up with “a seamless and complete package, where each of the segments were closely linked to each other,” despite the changes in genre from pop to classical. He added, “Also, we felt that the space created by transitions could be used to showcase the solo abilities of our performers, giving them room to creatively express themselves while still being part of the team concept!” Their performance was also punctuated by percussion instruments for comedic effect, which kept audience members entertained and enhanced the atmosphere of their performance. It goes without saying that the amount of effort put into the process was integral to determining each house’s outcome. BB on decided their repertoire the very day competition requirements were released. This enabled them to finish composing and begin rehearsals more than a week before the actual event. 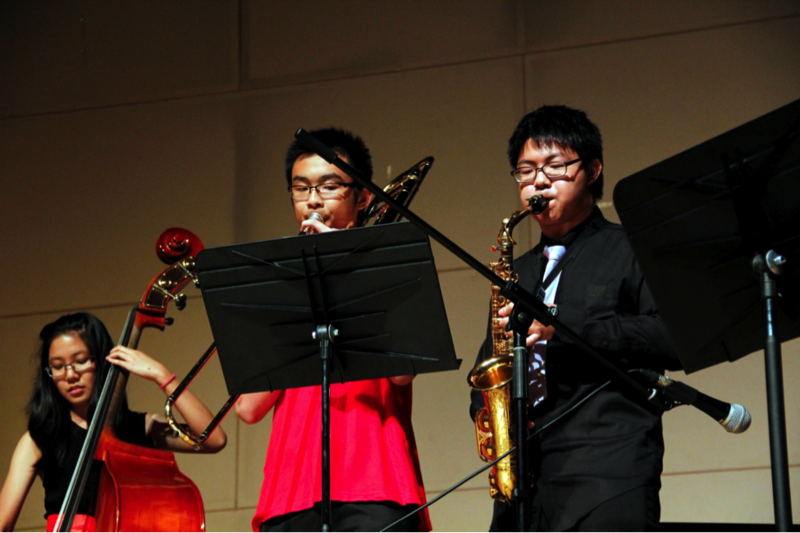 Practicing up to five hours a day in the leadup to Musicfest took serious dedication from each member of the team. Indeed, BB’s unbroken melody seemed well-rehearsed, and while there were minor slip ups in the otherwise powerful vocal performances by Emma Lau and Lorraine Fong, the overall reception to their performance was positive. HH’s team was prepared enough that sheet music was unnecessary. Those in attendance that night might also remember that HH was the only house that didn’t use sheet music onstage – again a testament to their confidence. Said Casey Chan, HH’s violinist, “I think that intuition, creativity and the ability to improvise, rather than the following of a fixed music score, are core traits of true musicians that the HH team have emulated well in Musicfest.” Another benefit of not needing scores was that the stage looked less cluttered, and the HH team, more cohesive. 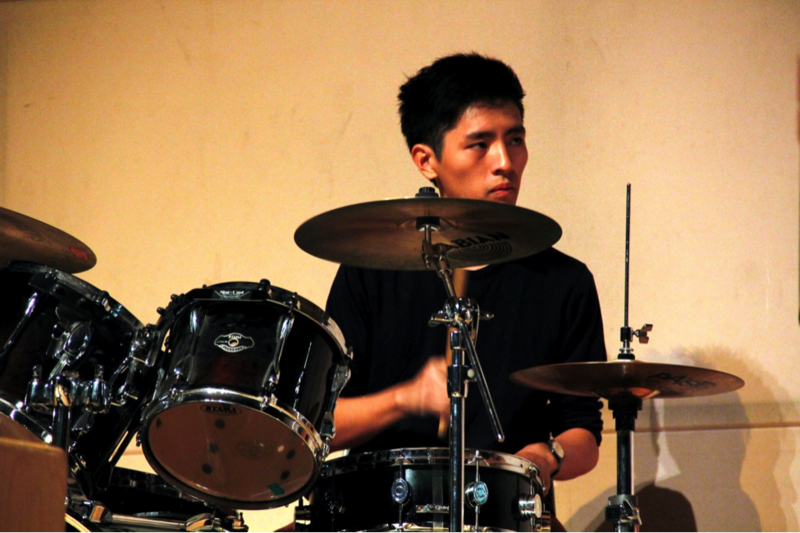 BW’s Gordon Kang on the drums during a piano/drums duet with Dean Fu (not pictured). Determined to impress, BW decided to take a chance with a self-composed song, titled Mimblegrimble. BW’s Gordon Kang said that his original song performed during Musicfest was not a last-minute composition, but something he composed a while ago and dusted off for this competition: “I hate forcing out music so I thought it’ll be more interesting to start with sometimes refreshing and original.” In a stroke of creative genius, they also performed a memorable, fast-paced piano/drums duet rendition of Moonlight Sonata 3rd Movement, which, again, distinguished them from the rest. However, it wasn’t smooth sailing for all houses. Over the course of Musicfest preparation, each house inevitably met with their fair share of difficulties, which contributed to the quality of their final performance. As with any team effort, coordination is necessary, and for HH, their biggest challenges during rehearsals originated from technical difficulties, and the difficulty of coordinating rhythm and tempo. Despite a relative lack of preparation, MT’s team put up a commendable performance. Prior to the big day, rumours that MT had only started rehearsals on Wednesday were circulating. These were confirmed by Ace Tay, who played the trombone during their performance. Said Ace, “There were only three or four practices. We only decided on the songs in the first practice, and decided to play This Is War two hours before Musicfest.” This was perhaps because, according to Stefanus, their vocalist, no Musicfest IC was officially appointed for MT, and preparations only began in earnest the Saturday before. More remarkable is the fact that Shawn Chan, their drummer, was in fact recruited as a pianist and learned to play the drums a day before Musicfest to compensate for their a general lack of diverse instruments, including the drums. That said, it is a testament to these performers’ grit and their dedication to their craft that these houses managed to pull through and put up a commendable performance. The judges specifically pointed out that sound imbalance was a recurring leitmotif among all the houses – that the loudness of the electric guitar and drums, for instance, drowned out the rest of the ensemble. Also, occasionally, in the attempt to max the number of instruments, the outcome was more of a dissonant. Consequently, BB’s win was probably due to their seamless arrangement, evident in Ms Kwok’s parting comments, ‘Think of music as a soundscape: you can design the sounds that you want to create… but [an instrument] has to either cut through or blend, not stick out like a sore thumb’. From the looks of it, BB managed to achieve that precise blend. Mr. Jarrod Lee pointed out that many singers tried too hard to emulate an American style, and advised the performers to ‘find your own voice, your own beat, your own style’. Ultimately, one needs to accept that a one-time performance always leaves as many regrets for the performers as awe it gives to the audience. Due to nervousness, or the lack of time to pursue perfection, stage performances rarely reflect the hundred percent ability of individuals. Beyond the music technicalities, we are even more impressed by the amount of effort and dedication each house invested to see a performance from its start to the end. For first-time participants especially, Musicfest was a valuable learning opportunity, allowing BB’s Emma Lau to “learn and develop the technical skills of the pop/rock genre”, while seeing firsthand “how instruments come together”.